The slow cooking process of this stew produces meat that is super tender. I would encourage you to make this a day before you serve it. The flavors sort of develop, and I believe the difference is noticeable. See below for some interesting things about lamb. If you are unfamiliar with lamb this recipe is a great introduction. You can substitute an equal amount of beef for lamb if you like. You can also substitute some cubed Yukon Gold potatoes instead of the beans. Cook rinsed and cleaned beans until nearly done, 45-60 min, and drain. You can skip this step if you’re using canned beans. 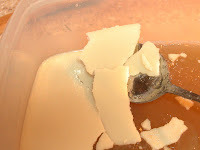 Heat about a ¼ cup olive oil (or I like to use the fat on the top of the stock after it has chilled) in the soup pot you are using. Combine the lamb, salt, pepper, and flour. Brown the meat for a few minutes. Now add the wine, stock, and tomato, and bring to a simmer. Cover and cook for about 1½ hours. With more olive oil, sauté the garlic and onion, seasoning them with some salt and pepper as they cook. Add these and the celery to the soup. Cook for another 15 minutes. Tie a few herb sprigs together (2 rosemary, 6+ thyme, and the inner celery leaves) with some string, and put this in the soup. Also add the beans at this time. Cook for another 45 minutes. 5 minutes before the soup is done, you can add some peas. This adds color and a little freshness to the soup. You can serve the stew immediately or chill for later. Adjust seasoning with salt and freshly ground pepper as the stew cooks. Maintain a good simmer throughout the cooking time. The total cooking time could be up to three hours. I like lamb and have really been enjoying the sheep we raised on our property. It turned out to be all worth it (although I wasn't the one who tended to the sheep, I still had to deal with the its noise). 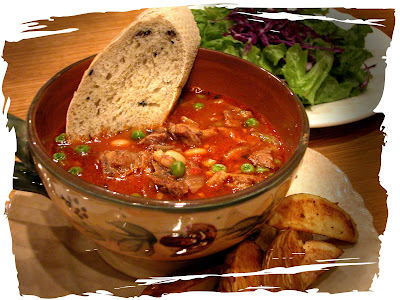 I recently made this stew using meat from it. Here is an interesting quote about lamb form a book we have called Cutting-up in the Kitchen. "It is interesting to note that throughout the rest of the world, lamb is one of the very few meats against which there are no prejudices. Beef is not consumed in India because of religious taboos. In Ethiopia cattle are hoarded like gold as an indication of wealth, but no one would eat one. Pork is not eaten by Moslems or followers of the traditional Jewish faith. But with the possible exception of fish, there are fewer prejudices against lamb than any other meat. It is, to some, a symbol of purity. 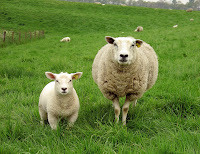 This reputation is based at least partly in fact: fewer lambs are condemned by government inspection than any other class of meat animal." Lamb is the term used for "young sheep". It is also used to refer to the meat of a sheep. Here is a good visual of the various cuts of lamb. Please leave a comment if you have a comment or question about this recipe or any other recipe. Also let me know if you made it and tell me how it was. You can leave a comment by clicking on the comments link. We made this for dinner tonight. It was soooo yummy!! We used beef instead of lamb and substituted potatoes for the beans, as we didn't have any lamb on hand. It turned out so well that we are planning on trying it again soon with lamb. Thanks for the great recipes Peter! We love your blog! Thanks for the feedback. That's encouraging. I haven't forgot about the curry. Keep checkin in!